YOU Made it Happen! Governor Corbett has Signed the PBCC’s Breast Density Notification Act into Law! Posted By PA Breast Cancer Coalition on November 15th, 2013 at 8:42 am | 2131 comments. Early detection saves lives. That’s why November 1, 2013 was such an important day for the women of Pennsylvania. As a perfect conclusion to Breast Cancer Awareness Month, Governor Tom Corbett signed the PBCC’s Breast Density Notification Act into law, requiring mammography facilities to notify women and their physicians of their breast density. This life-saving legislation, sponsored by Sen. Robert Mensch, brings attention to dense breast tissue and what it can mean. That dense tissue can increase a woman’s risk of being diagnosed with breast cancer at a later, more dangerous, less treatable stage. Many women with dense breast tissue do not know they have it, and a mammogram may not be enough to detect a lump or irregularity in the breast. The Breast Density Notification Act will change that. 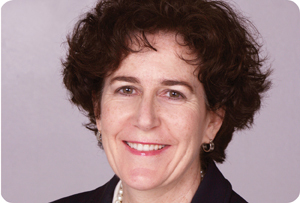 Now, mammography facilities will be required to alert their patients who have dense breast tissue and possibly offer information on additional screening options. Thank you to the courageous women who were diagnosed with late-stage breast cancer because of their dense tissue who stood up and shared their brave stories with us over the past year. The PBCC also thanks Sen. Robert Mensch, Rep. Karen Boback, Rep. Matthew Baker, Rep. Mike Turzai and Rep. Frank Dermody for their leadership in the unanimous passage of the Breast Density Notification Act. Thank you all for turning awareness into action! The Breast Density Notification Act would not have passed without the support of our brave breast cancer survivors. Cindy Spinello of Union County was diagnosed with late-stage breast cancer last year. She had dense breasts and she didn’t know it. So, she decided to take action. Click on the VIDEO below to hear more about her courageous journey to make an impact and what this legislation means for women in Pennsylvania. Posted By PA Breast Cancer Coalition on November 15th, 2013 at 8:38 am | 1741 comments. One day in April 2010, I happened to raise my arm and I felt a bit of a lump on my breast. I had had a mammogram about six months earlier but nothing showed on the mammogram. There could be a million reasons why the mammogram didn’t detect it, but my understanding is that I have dense breast tissue. I started reading online stories written by women who had similar experiences. Some of them had really advanced stage breast cancer at the time they were diagnosed and it was just devastating. Many of those women believe that if they had been informed that their breasts were dense, they might have had additional testing and may have been diagnosed at an earlier stage. I was so moved by their stories that I felt compelled to reach out to Pat Halpin-Murphy and the PBCC. 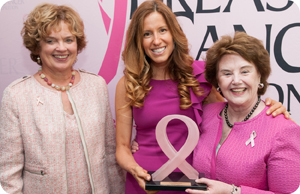 I knew she was a strong advocate for breast cancer and that she and the organization knew how to get things done. The good news for me was that the cancer was caught early. I had a lumpectomy, chemo and radiation and I have a good prognosis. I work as Director of Foreign Affairs in Philadelphia Mayor Nutter’s office. For relaxation I like to play tennis, swim, and I love to read. I recently bought a piano and I have started taking piano lessons. Thank You for Making the 2013 PBCC Conference a Success! Posted By PA Breast Cancer Coalition on November 15th, 2013 at 8:37 am | 1188 comments. What a way to celebrate 20 Years of supporting and representing Pennsylvania’s breast cancer survivors and their families! The 2013 PA Breast Cancer Conference was a huge success from the Pink Party kick-off event to the survivor’s reception, we had a wonderful time with all of you. We were fortunate enough to spend the day learning with you about the latest developments in breast cancer research, treatment and recovery. Together we can find a cure for breast cancer now … so our daughters won’t have to. We want to hear about your Conference experience. Don’t forget to take the post-conference survey here. Click here for photos from the 2013 Pink Party and Conference! Posted By PA Breast Cancer Coalition on November 15th, 2013 at 8:37 am | 1950 comments. A recent study performed by the Epidemiology Research Program at the American Cancer Society found that postmenopausal women who walked at least seven hours per week, usually about an hour a day, had a 14% less risk of developing breast cancer than those who walked fewer than three hours per week. 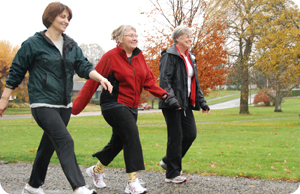 Exercise, in general, lowers the risk of breast cancer for both postmenopausal and premenopausal women. A study that looked at younger women performed by the School of Public Health at the University of Minnesota studied sedentary, premenopausal women. This study found that exercise altered the levels of metabolites in the body which may decrease the chance of breast cancer. Posted By PA Breast Cancer Coalition on November 13th, 2013 at 2:41 pm | 2425 comments. 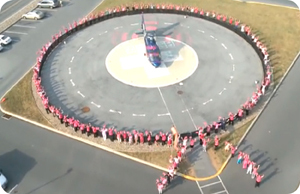 After hours and hours of filming, costume changes, roller coaster rides and even roller-skating surgeons, the Penn State Milton S. Hershey Medical Center’s Pink Glove Dance viral video has taken second place! For the second year in a row, the hospital submitted a video featuring its staff wearing pink gloves to a national campaign. Thousands of viewers voted online for hundreds of video submissions and Penn State raised $10,000 for the PA Breast Cancer Coalition! The Pink Glove Dance was created by Medline Industries, Inc., a nationwide medical supply company to promote breast cancer awareness while allowing cancer organizations to earn money for their programs and services. Last year, Penn State entered the competition for the first time and won $5,000 for the PBCC. This year, the medical center placed second and raised more than $12,000 total to support the PBCC and breast cancer survivors across the state. THANK YOU PENN STATE HERSHEY! If you didn’t get a chance to watch Penn State Hershey’s award-winning video, click here. Posted By PA Breast Cancer Coalition on November 13th, 2013 at 9:55 am | 2530 comments. More than 100 Grassroots Partners held events to support PA breast cancer survivors in October! 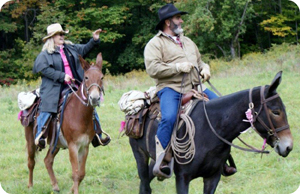 2013 was a busy year for Ride the Trail to a Cure and the Grey Mare Society as they held 3 events to benefit the PA Breast Cancer Coalition! The Clinton Anderson Ball Toss was a huge success, held over the summer at a Harrisburg Horse Show and lead by Linda Golden. September was the New Millford Ride, organized by B.J. Carey at Pie in the Sky Orchard, Susquehanna County, and October was host to the ride in Mt. Holly Springs, Cumberland County, where coordinator JoAnn Gilkey took the reins. These tremendous events contributed over $17,000 to the PBCC to help serve women and their families battling breast cancer! 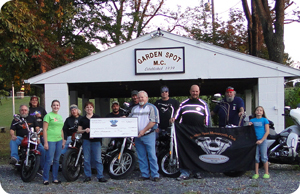 Members of the Garden Spot Motorcycle Club were revved up for this year’s 5th Annual Ride to Help, held in Adamstown, Pa. The event featured not only a motorcycle ride, but also featured a full-on pig roast party with games, food, drinks, a live band and even a dunk tank! Proceeds collected totaled an incredible $4,000–their largest donation yet! Since 2009, this annual event has contributed over $15,600 to the PA Breast Cancer Coalition! Red Land High School Girls Soccer in York County recently held a “Pink Out” game which raised $1,000 for the PA Breast Cancer Coalition! 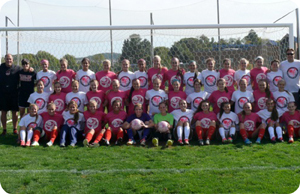 Both the JV and Varsity squads worked with the soccer boosters to sport pink and raise awareness on the field. The girls also hosted a bake sale, sold t-shirts, held raffles and accepted donations to support our cause. If you would like to get involved with the PA Breast Cancer Coalition by hosting an event in your community, call 800-377-8828 or email Kristen@PABreastCancer.org. Posted By PA Breast Cancer Coalition on November 13th, 2013 at 9:50 am | 1633 comments. 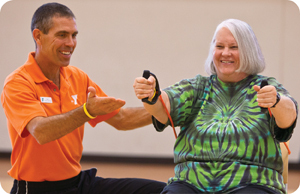 Livestrong offers FREE 12-week, small group fitness programs at various YMCAs around the country aimed at helping cancer survivors in the transitional period between completion of treatment and the shift to feeling physically and emotionally strong enough to return to a “new normal.” Instructors work to fit the program to each participant’s individual needs.